Ron Cress inspecting the new transmitting tower just installed in front of his office/studio in the Sun City Center Corporate Center between CVS and Winn Dixie. 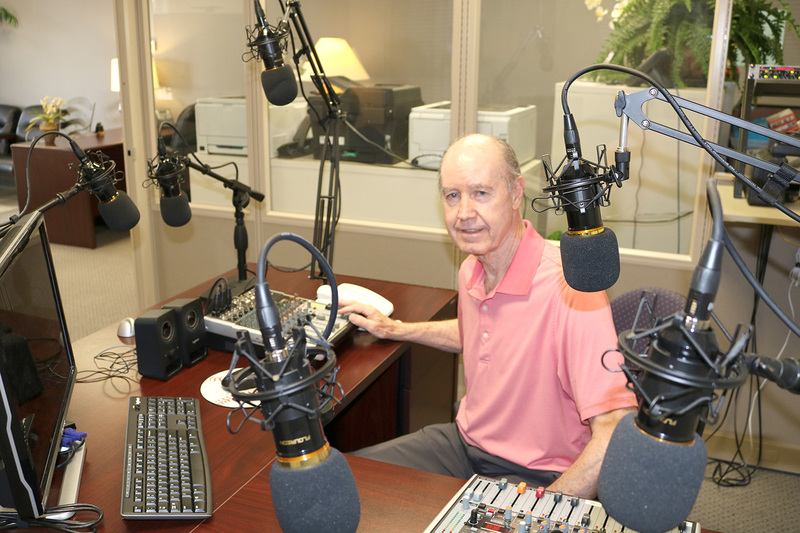 The SCC Observer recently visited with Ron Cress, owner and operator of a new radio station serving Sun City Center. Cress responded to questions about the new radio station Grace FM 100.1 on your FM dial. 1. How long have you been in business in Hillsborough County? Where are your business locations? Grace FM incorporated in June 2018, so officially we have been in operation less than one year. We are a nonprofit corporation and have applied for 501(c)3 status so that gifts to Grace FM will be tax deductible. We hope to be “listener supported,” but are also looking for a limited number of business supporters. We broadcast from our studio located at 139 S. Pebble Beach Blvd. in Sun City Center 24 hours every day. Ron Cress broadcasting from his Sun City Center studio. 2. What type of business do you own? Grace FM is a low-power FM radio station broadcasting at an effective radiated power of 100 watts. Listeners can hear us at 100.1 on their FM radios. 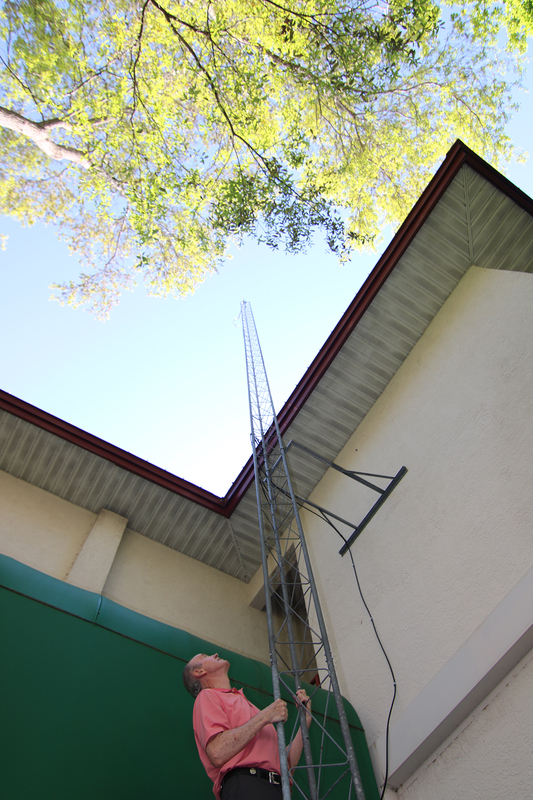 Our signal can be heard within a radius of about 6 miles from Sun City Center. We also broadcast over the internet at www.GraceFM.net, and are currently reaching listeners as far away as Canada. Grace FM is a Christian broadcaster and is dedicated to spreading the Good News of the Gospel of Jesus Christ in word and song. Our current programs include Answers in Genesis, Sun City Center Preacher, Ask An Attorney with Joe Pippen, Bill Gaither’s Homecoming Radio, and Unshackled, the longest running radio drama in history. Christian music is the greater part of our broadcasting day. We play classic Christian music from the ’70s, ’80s, ’90s and more. Grace FM features less talk ­— more music. 3. What did you do professionally before your present business? In addition to being the president and general manager of Grace FM, I am the broker/owner of Real Property Marketing, Realtors® also located in Sun City Center. I have been in the real estate business full time for more than four decades. 4. Where did you grow up, attend high school and college? I grew up in the Dayton, Ohio area. I attended Bob Jones University where I majored in radio and television. I graduated from Moody Bible Institute with a Bachelor of Science in Biblical Studies. 5. What are some of the challenges of your business? Many aspects of running a radio station are challenging. Among those are: Programming, music, technology and equipment. Raising revenue and finding volunteers are other ongoing challenges. Radio has changed dramatically since the ’60s when transmitters were the size of refrigerators. The transmitter that we use is not much bigger than a desktop computer. Turntables and reel-to-reel tape decks have been replaced by computers and radio automation software. Handwritten logs were kept throughout the broadcast day. Now the software meticulously logs every event including individual songs and each announcement that is played. 6. What gives you a sense of contentment and satisfaction with your business? Seeing the station come together into a viable entity. Knowing that our station meets a unique need in our community and the surrounding area. 7. What is the short term and long-term outlook for the South Shore area? In the short term, we will be reaching out to the churches in our area to offer them a place where church events of potential interest to the wider community can be publicized. In the longer outlook, as the area close to Sun City Center grows, we will seek to include programming that meets the needs of younger families in our listening area as well as the needs of the growing number of retirees in our area. 8. Anything you would like to add, either about your business or your personal/family life? Grace FM is pleased to be a part of the local community and to provide a valuable service.